Air conditioning failure – Emergency ice cream delivery! With temperatures in the high twenties in London, a fault with the air conditioning caused the team at Minoli London to send out for an emergency ice cream delivery! Luckily, Lucy (Minoli) and her friend Charlie were on hand, having a day of the summer holidays helping in the showroom, to run down to the Selfrdiges food hall and bring back some delicious authentic Italian Ice cream. Jonathon said, ” it had been a long hot day with plenty of meetings and things to do, with the temperatures high outside we noticed that the meeting room was getting rather warm and the newly installed air conditioning just wasn’t managing to keep it cool, so a service call was made for the system and luckily we had Lucy and Charlie on hand”. 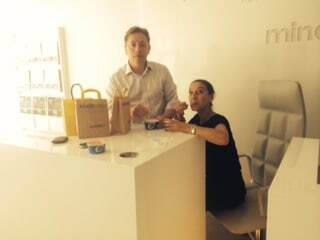 Pictured, Jonathon and Maria, showroom Manager, cooling down with a delicious ice cream.